This page shows you how to edit your account once you have created an account. After logging in, you are able to change the information on any of your family member's record, or register children into sports, or pay your outstanding balance. These instructions assume you have already created an account. 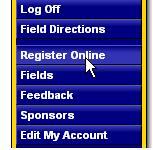 To see specific instructions about how to register for sports or pay the annual membership fee, please return to the Help home page. 2) Enter email and password and click Submit. 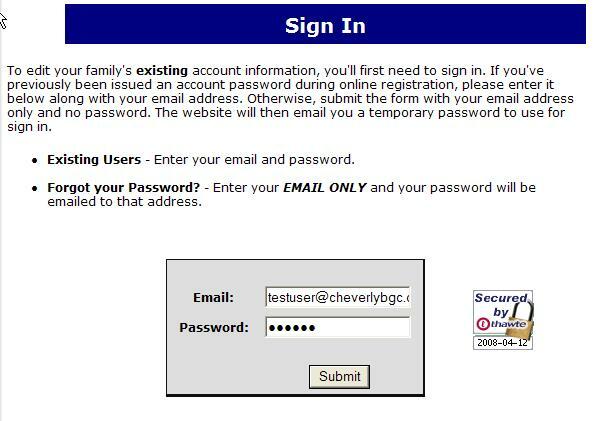 If you forgot your password, just enter your email and your password will be emailed to you. a) Notice that it lists all the members of your family, and any programs they have registered in. b) You may click on the Pay Now button to pay any outstanding balances. 5) To log off, click on Edit My Account in left hand navigation bar and then click on 'Log out' button toward the top of the page. You can also click on Log Off link on left hand navigation bar, and follow directions. If you are on a public computer, its best to log off and then exit/close the browser entirely.